Snacks can help curb children's hunger and provide an energy boost between meals. But it's important to remember that snacks are not meals. Your child should arrive at meals hungry and ready to eat, not full from snacking. The trouble with most popular children's snacks, like biscuits, cakes, chocolate and thickshakes, is that they're sugary and fatty. Or they're salty and fatty like crisps, movie popcorn, instant noodles and crackers. 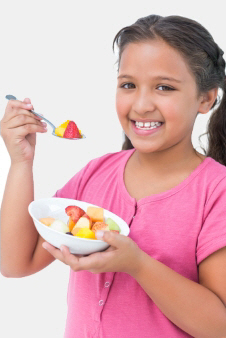 If your child eats lots of these foods they can end up putting on weight. Snacks that are sweet and chewy such as lollies, dried fruit and fruit leathers stick to your child's teeth and can cause tooth decay. Snacks don't need to come in packets. They can be easily and cheaply made at home. Frozen fruit such as grapes, peeled mandarin segments or a banana. Spear a peeled banana with a wooden ice block stick and freeze it. A fruit platter with low-fat yoghurt to dip the fruit into. Fruit kebabs. Put cubes of fruit onto bamboo skewers. A homemade fruit smoothie. For one serving, put ¾ cup low-fat milk, ¼ cup low-fat yoghurt, 1 banana and ½ cup canned peaches (in juice) or frozen raspberries into a blender or food processor. Blend until smooth. Chopped vegetables such as capsicum (pepper), carrot, celery with hummus, cottage cheese, or a yoghurt-based dip. See the recipe below. Three to four wholegrain crackers with hummus and sliced tomato or thinly sliced reduced-fat cheese. A bowl of pumpkin or other vegetable soup made with low-fat evaporated milk or low-fat milk instead of cream. Half a cup of leftover baked vegetables such potato, kumara or taro. A glass of low- or reduced-fat milk (green, yellow or light blue top). A slice of toasted wholegrain bread with a healthy topping such as mashed banana, sliced tomato and shaved ham, hummus and grated carrot, or a thin spread of peanut butter. A pottle (125 g) of low-fat yoghurt. High-fibre cereal such as Weet-Bix with low- or reduced-fat milk. Ice blocks made from diet cordial. Get your children involved. Create a list of healthy snacks together and stick it on the fridge. Lighten your workload by cutting up extra vegetables at dinner time for snacks the next day. Make a big bowl of fresh fruit salad for dessert. The leftovers can be used for the after-school snack the next day. Don't let your child graze between meals. A healthy snack mid-morning and after school is all they need. Offer your child a choice, for example, "you can have a fruit smoothie, or a glass of milk and a piece of fruit." This helps them feel like they have some control over what they eat and can help to avoid battles at snack times. If you don't have a food processor or blender, you can make fruit smoothies in an empty jar or milk bottle. Mash the fruit together and put it into the jar or plastic milk bottle along with the yoghurt and milk. Screw the lid on tightly and shake the jar or bottle really well. Serve snacks on a plate. Encourage your child to sit down to eat in the kitchen or dining room. Don't let them eat in front of the TV or computer. Keep chocolate, biscuits, cakes, muesli bars, chips and lollies as occasional foods, once or twice a week. Your child shouldn't eat these foods every day. But banning them can make your child want them more, and lead them to seek them out when they are away from home. Mix the yoghurt with the mayonnaise. Stir in the cucumber and chopped or dried mint. Serve with vegetable sticks or wholegrain crackers. For more healthy and tasty dip recipes that are quick and easy to make see Make dips your thing from My Family Food.